Reference number for this case: 27-sep-54-Rixheim. Thank you for including this reference number in any correspondence with me regarding this case. "Binoculars revealed that it had the shape of a long cigar, and a dozen small satellite cigars surrounded it. A railway worker on night duty said he had observed the same phenomenon." Various ufology sources mention the case, giving the date of September 27, 1954. Aimé Michel makes of it a "vertical" cigar. In these sources, the hour is given as the night, or in the night from the 27th to the 28th, or at 11:45 p.m. or at midnight or in the early morning. 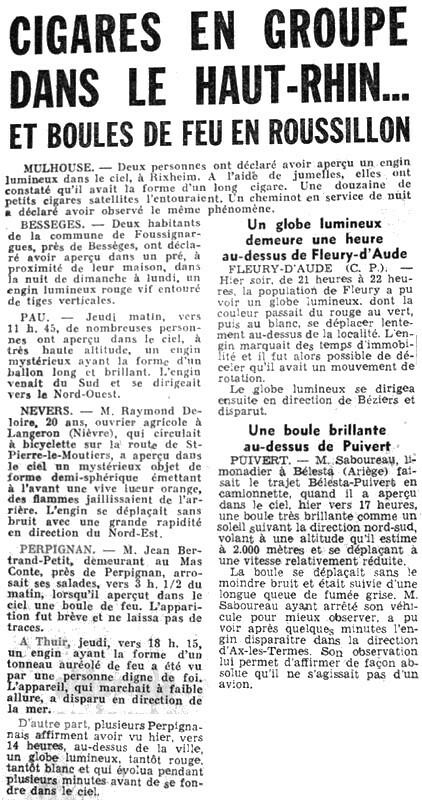 The author indicates that in October 1954, two people near Mulhouse, in the Haut-Rhin, on the France-German border, saw a cigar-shaped luminous object surrounded by twelve smaller satellite fusiform objects. 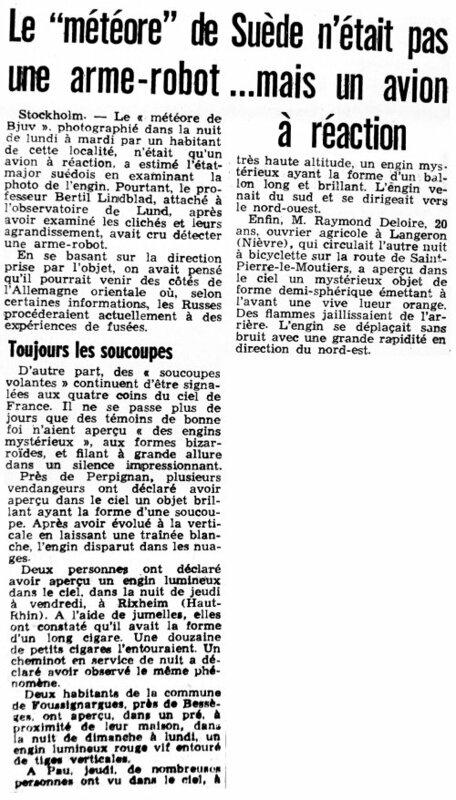 French ufologist Aimé Michel reports that in the night of the 27 to the 28th of september 1954, a big vertical cigare accompanied by its small satellites was seen in Rixheim. Two people had seen a luminous spot in the sky, had sought binoculars, and using the binoculars had been able to distinguish the large cigar and its procession of smaller satellites. "... a long machine in the shape of a cigar around which ten much smaller luminous points flew in all directions." Michel notes that a railwayman who was in service of night has the station made the same observation independently. The observation was told by the newspaper France-Soir of October 2, and the article dated the event as of October 1. Aimé Michel checked this date and found that the observation was really on September 27. Jacques Vallée indicates that on september 27, there was an interesting testimony in Rixheim. Three people in Rixheim, France, reported an elongated UFO in the night sky on the 27th. One was a railroad worker who sighted the object and made a report separately from the other two witnesses. The best description was from two people whose names and occupation are not known. They used opera glasses and claimed they could see.-"...a long craft in the shape of a cigar around which ten or more much smaller luminous points navigated in every direction." 139. 139. Paris, France. France-Soir. 2 October 54. Some of the other cloud-cigar reports from the 1954 French wave include: September 27, early morning, Rixheim (Haut-Rhine Department, Alsace). Two witnesses, having noticed in the sky a peculiar elongated, motionless, luminous spot, studied it at leisure with binoculars. They made out "a long craft in the shape of a cigar, around which 10 or more much smallerluminous points navigated in every direction." A third witness made an independent report with the same description. Luc Chastan indicates in his database that in the Haut Rhin (68) in Rixheim on September 27, 1954 at an unknown hour, "In the night from the 27 to September 28, 1954, a large vertical cigar accompanied by its small satellites was observed. Two people had seen a luminous spot in the sky, had sought binoculars, and using the binoculars had been able to distinguish the large cigar and its procession of small satellites. Description by these two people was "a long machine in the shape of a cigar around of which sailed in all direction ten luminous points much smaller." A railwayman who was on night duty at the station made in an independent manner the same observation." The sources are indicated as: "M.O.C. by Michel Aimé ** Arthaud 1958" and "Les OVNI vus de près by Gross Patrick ** http://ufologie.net". The website indicates that on 27 September 1954 at 23:45 in Rixheim, France, "Huge cigar, 12 smaller UFOs orbit in all directions. Explanation: Planet." And: "Cigar-shaped objects were observed. Multiple independent witnesses. More than 10 cigar-shaped objects were observed by three witnesses in a city for over three minutes." For lack of precise data, for now, I am unable to decide what this could have been. [am1] "Mystérieux Objets Célestes", book by Aimé Michel, Seghers publisher, France, pp 129-130, 1977. [jv6] "Les Phénomènes Insolites de l'Espace", book by Jacques and Janine Vallée, Robert Laffont publisher, France, page 94, 1978. [lg1] "The Fifth Horseman of the Apocalypse - UFOs: A History - 1954 October", monography by Loren E. Gross, USA, page 69, 1991. [ht1] "Satellites Objects and Cloud Cigars", article by Herbert S. Taylor, International UFO Reporter (IUR), Center for UFO Studies (CUFOS), USA, volume 29, #1, summer 2004. 1.1 Patrick Gross May 25, 2010 Addition [le1]. 1.2 Patrick Gross June 18, 2010 Addition [jv5]. 1.4 Patrick Gross October 24, 2011 Addition [in1]. 1.5 Patrick Gross June 4, 2015 Addition [sp4]. 1.5 Patrick Gross December 19, 2016 Additions [lg1], [ub1]. 1.6 Patrick Gross March 23, 2017 Addition [lo1]. 1.7 Patrick Gross April 2, 2017 Addition of the Summary, Explanation changed, were "Not looked for yet.". This page was last updated on April 2, 2017.